WASHINGTON (AP) — Leaders in three major cities are in a last-minute scramble to win the 2020 Democratic National Convention, an event that could funnel millions of dollars into the local economy and put them at the center of the political world for one week next summer. But since then, a fierce debate has unfolded behind the scenes over which city can raise enough money, avoid labor disputes and prove they have enough high-end hotels and event accommodations. “We have a lot of questions that we need to resolve before we make a final decision,” Perez said in an interview, insisting that each finalist still has a legitimate chance to win and that he would decide by the end of February. 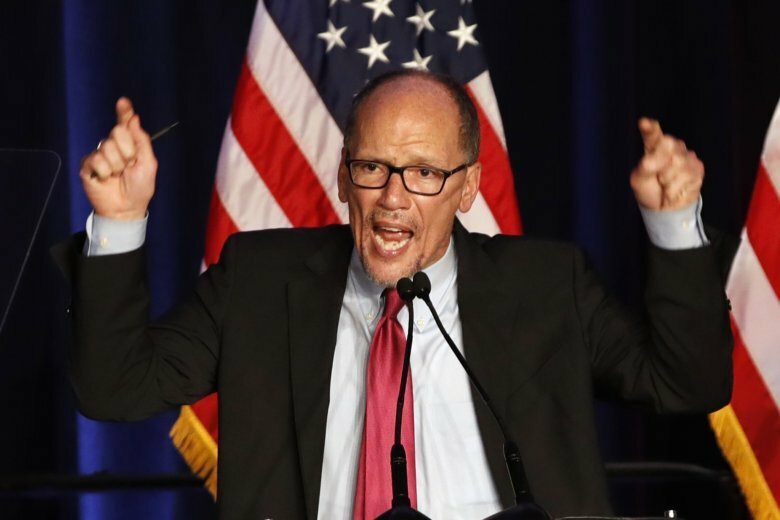 Perez has promised a convention that showcases the nominee and gives the Democratic ticket an opportunity to unify the party after what’s expected to be a bruising, wide-open primary fight. The convention is set for July 13-16, 2020. Republicans have already selected Charlotte, North Carolina, to host their Aug. 24-27 gathering. Perez declined to cite specific concerns about the finalist cities, but interviews with multiple senior party officials and Democrats in Wisconsin, Texas and Florida reveal key questions for each city. For Milwaukee, the smallest of the finalist cities, the chief concern is whether the hotel and event venues can provide the total convention experience. The metro area’s recently expanded hotel stock offers enough rooms. But the hotel and entertainment footprint includes fewer high-end properties and full-service hotels than the other two cities. Beyond the hotel rooms, a presidential convention city needs enough hotels for each of the 57 state and territorial delegations to host daily sit-down breakfast meetings. And the evening itinerary is typically full of dozens of parties hosted by corporate interests, political action groups, top party officials and some state parties. “We are confident we have those venues — museums, restaurants, the waterfront,” said David Bowen, vice chairman of the Wisconsin Democratic Party. But Wisconsin officials acknowledge they are asking Perez to give the city the biggest event it has ever hosted. Milwaukee could have an ally in nearby Chicago, where some leading Democrats have argued that top donors could stay and entertain before traveling to Milwaukee for the biggest prime-time events such as the presidential and vice presidential acceptance speeches. For Miami, officials say the question is transportation. Like Houston, Miami has hosted large conventions and Super Bowls. But a considerable number of its hotel rooms are on Miami Beach, requiring buses to cross just a few bridges to downtown. That raises the specter of delegates having accommodations close to the festivities but still spending inordinate amounts of time on buses stuck in traffic. There’s also a weather risk; the convention comes seven weeks into hurricane season. Republicans had to change their Tampa convention schedule in 2012 because of Hurricane Isaac. Milwaukee advocates emphasize their usually pleasant summer weather, in contrast to the almost guaranteed heat in Houston and Miami. Perez has made clear that logistics are more important than how a host city might play into the eventual nominee’s campaign narrative. But some local advocates are pushing their cases nonetheless. Wisconsin Democrats are celebrating midterms that ousted Republican Scott Walker from the governor’s office. State Chairwoman Martha Laning says coming to Milwaukee would showcase the party’s determination to reclaim the working class across the old industrial upper Midwest. Texas doesn’t have any high-profile statewide Democrats, but the party flipped three suburban House districts and a slate of legislative seats and dominated local races in the state’s most populous counties. Hinojosa credited both a growing Latino population and Democrats’ success with college-educated suburbanites across demographic lines. “If you want to be where the future of the party is going, come to Texas,” Hinojosa said. Political arguments aside, there is no provable tie between convention sites and November outcomes. Trump won battleground Ohio handily in 2016 after the GOP convention in Cleveland. President Barack Obama won Colorado in 2008 after being nominated in Denver but lost his second convention state — North Carolina — four years later. President George W. Bush lost both states — Pennsylvania and New York — where he was nominated.